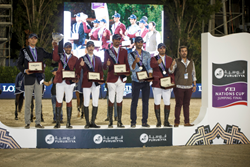 The winning team: Chef d’Equipe Willem Meeus, Ali Yousef Al Rumaihi, Khalid Mohammedd Al Emadi, Sheikh Ali Bin Khalid Al Thani, Hamad All Mohamed Al Attiyah and Bassem Hassan Mohammed. The man who clinched victory for his country, Bassem Hassan Mohammed, described his side’s success as “a big day of history for Qatar, and I’m really happy for this!Congratulations to the Qatar Equestrian Federation, to all my team and my family. I don’t think anything could be better than this at this moment!” he said with delight afterwards.